It has been suggested that this article be merged into sausage. (Discuss) Proposed since January 2019. This article is about the sausage. For other uses, see Boudin (disambiguation). Boudin (French pronunciation: ​[budɛ̃]) are various kinds of sausage in French, Luxembourg, Belgian, German, Quebec, Acadian, Aostan, Creole, Surinamese Creole, Austrian and Cajun cuisine. The Anglo-Norman word boudin meant 'sausage', 'blood sausage' or 'entrails' in general. Its origin is unclear. It has been traced both to Romance and to Germanic roots, but there is not good evidence for either. (cf. boudin)  The English word "pudding" probably comes from boudin. Boudin balls, made in Marksville, Louisiana. Boudin ball: A Cajun variation on boudin blanc. Instead of the filling being stuffed into pork casings, it is rolled into a ball, battered, and deep-fried. Boudin blanc: A white sausage made of pork without the blood. Pork liver and heart meat are typically included. In Cajun versions, the sausage is made from a pork rice dressing (much like dirty rice), which is stuffed into pork casings. Rice is always used in Cajun cuisine, whereas the French/Belgian version typically uses milk, and is therefore generally more delicate than the Cajun variety. In French/Belgian cuisine, the sausage is sauteed or grilled. The Louisiana version is normally simmered or braised, although coating with oil and slow grilling for tailgating is becoming a popular option in Lafayette, New Orleans, Lake Charles, and Baton Rouge. Boudin blanc de Rethel (pronounced [bu.dɛ̃ blɑ̃ də ʁə.tɛl]: a traditional French boudin, which may only contain pork meat, fresh whole eggs and milk, and cannot contain any breadcrumbs or flours/starches. It is protected under EU law with a PGI status. Boudin noir: A dark-hued blood sausage, containing pork, pig blood, and other ingredients. Variants of the boudin noir occur in French, Belgian, Cajun and Catalan cuisine. The Catalan version of the boudin noir is called botifarra negra. In the French Caribbean, it is known as boudin Créole. In Britain a similar sausage is called "black pudding", the word "pudding" being an anglicized pronunciation of boudin, and probably introduced after the Norman invasion. Boudin rouge: In Louisiana cuisine, a sausage similar to boudin blanc, but with pork blood added to it. This originated from the French boudin noir. Brown Rice Boudin: Brown-rice boudin is a less common variation made from brown rice with taste similar to traditional pork boudin. Crawfish boudin: Popular in Cajun cuisine, crawfish boudin is made with the meat of crawfish tails added to rice. It is often served with cracklins (fried pig skins) and saltine crackers, hot sauce, and ice-cold beer. Gator boudin: Made from alligator, gator boudin can be found sporadically in Louisiana and the Mississippi gulf coast. Shrimp Boudin: Similar to crawfish boudin, shrimp boudin is made by adding the shrimp to rice. It is great for appetizers or party food served in thin slices. 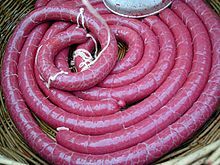 Bloedworst (Blood Sausage): In Surinamese Creole culture, bloedworst is typically made with pig blood, onions, garlic and breadcrumbs. Though spices and herbs may vary, the texture is smooth and soft, almost of a melted-like consistency. After filling the pork casing, it is put into a large cooking pot and cooked in water with spices and herbs like onions, garlic and Chinese celery. It is usually served with vleesworst (meaning "meat sausage", a Surinamese Creole white pudding which is made in the same way but substitutes the blood for minced pork) and fladder, all cooked in the herbed and spiced broth. If the customer so wishes, it is eaten with sambal, a puréed pepper mixture. Most often the Madame Jeanette is used. Boudin gave rise to "Le Boudin", the official march of the French Foreign Legion. "Blood sausage" is a colloquial reference to the gear (rolled up in a red blanket) that used to top the backpacks of Legionnaires. The song makes repeated reference to the fact that the Belgians don't get any "blood sausage", since the King of the Belgians at one time forbade his subjects from joining the Legion (verse says "ce sont des tireurs au cul"). ^ Michael Stern (2009-05-07). 500 Things to Eat Before It's Too Late: And the Very Best Places to Eat Them. Houghton Mifflin Harcourt, 2009. ISBN 978-0-547-05907-5. Retrieved 2009-11-24. Wikimedia Commons has media related to Boudin.